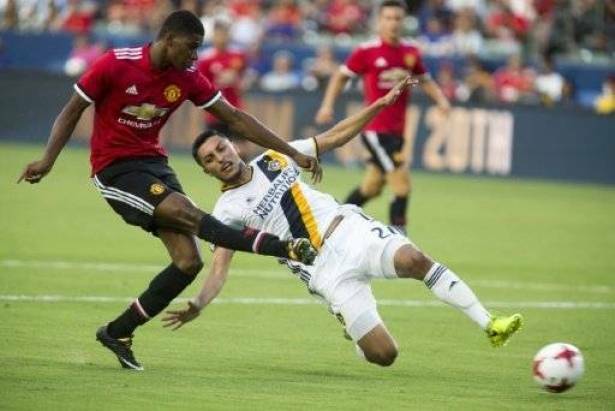 Marcus Rashford scored twice as Manchester United kicked off their pre-season tour of the United States with a 5-2 rout of the Los Angeles Galaxy on Saturday. Rashford opened the scoring after only two minutes, punishing an error from Ariel Lassiter near the Galaxy penalty area to dart in on goal and place his finish beyond goalkeeper Jon Kempin. The 19-year-old doubled his tally in the 20th minute, latching onto a clever pass from Juan Mata to make it 2-0. Marouane Fellaini put United 3-0 ahead five minutes later, tucking a low shot past the hapless Kempin after good work down the left flank by Jesse Lingard. United boss Mourinho changed his entire line-up at half-time, handing a debut to Lukaku, who completed his record transfer from Everton earlier this week. The Belgian international might have opened his United account within four minutes of coming on, but saw his shot saved by the Galaxy's Brian Rowe, who replaced Kempin at half-time. The remainder of the half resembled a training exercise, with United dominating possession against a Galaxy line-up who also made wholesale changes at half-time. Anthony Martial and Henrikh Mkhitaryan both went close while new signing Victor Lindelof should have done better with a close-range effort that flew over the bar. However on 67 minutes United got their fourth of the night when Martial burst forward and threaded a pass to Mkhitaryan who made no mistake with a confident low strike. Martial made it 5-0 five minutes later, rifling home Timothy Fosu-Mensah's pullback. The Galaxy meanwhile, who had failed to register a single attempt on goal in the first half, bagged the first of two late consolation goals when Giovani dos Santos caught Lindelof napping to score past Joel Pereira. A Romain Alessandrini corner was then nodded home by Dave Romney in the 89th minute, deflecting off Dos Santos on its way into the net.